Hey there, welcome to the day four of the April Neat and Tangled release. Let's take a look at the cute Making Magic stamp set. To create this card begin with a white cardstock background and cut a 1/2" strip off of the bottom. Add a layer of bright blue cardstock to the bottom edge. Use a circle steel die to create a window in the card. Add a fan of pink to red cardstock strips to create a swirl pattern behind the die cut window. Color all of the Making Magic icons with Copic markers. Add a sprinkle of yellow stamped stars to the background of the card and voila - a magical card! Neat and Tangled will be giving away a Making Magic stamp set. To enter, leave a comment below to be entered. Be sure to visit the Neat and Tangled blog on Friday for a list of winners. Good luck and thanks for stopping by! Hey there, welcome to the day three of the April Neat and Tangled release. Let's shake things up a bit and look at the Happiness Stamp and Steel Die set. To create this card begin with a white cardstock background and rectangle steel die to create the window of the shaker box. Add a transparency window and two layers of foam tape to backside of the frame. Glue some sequins from the Neat and Tangled Lemon Lime mix to the top of the card insert. Add some stamped hearts in blue ink and the sentiment at the top. Fill with sequins and glue the transparency top to the background of the card. Use the Happiness Steel Die to create the watercolored title. Glue to the front of the card and shake! Neat and Tangled will be giving away a Happiness stamp set. To enter, leave a comment below to be entered. Be sure to visit the Neat and Tangled blog on Friday for a list of winners. Good luck and thanks for stopping by! Hey there, welcome to the day one of the April Neat and Tangled release. 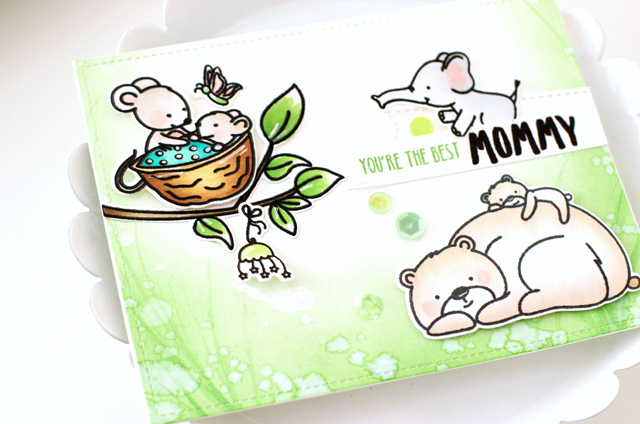 The first stamp set up is called Mommy, Daddy and Me and it's an adorable collection of baby and Mommy/Daddy animals. This is my favorite and cutest of April release. To create this card begin with a watercolor paper background that has been die cut with a stitched edge. Next, use Mowed Lawn Distress Oxide Ink to ink blend a green background. Use a thin pain brush to add blades of grass to background with Mowed Lawn Ink. Sprinkle some water on top and blot to create droplets. Next, color all images with Copic markers. Add sentiment to a die cut flag and layer to create title. Neat and Tangled will be giving away a Mommy, Daddy and Me stamp set. To enter, leave a comment below to be entered. Be sure to visit the Neat and Tangled blog on Friday for a list of winners. Good luck and thanks for stopping by! Hey there, welcome to the day one of the April Neat and Tangled release. The first stamp set up is called Have Courage and it's a beautiful floral set with inspirational messages. To create this card begin with Memento ink to stamp the floral image on the left and bottom of the card. Next, use Copic markers to color the flowers with a vibrant punch. Leave some of the flower petals at the bottom blank. 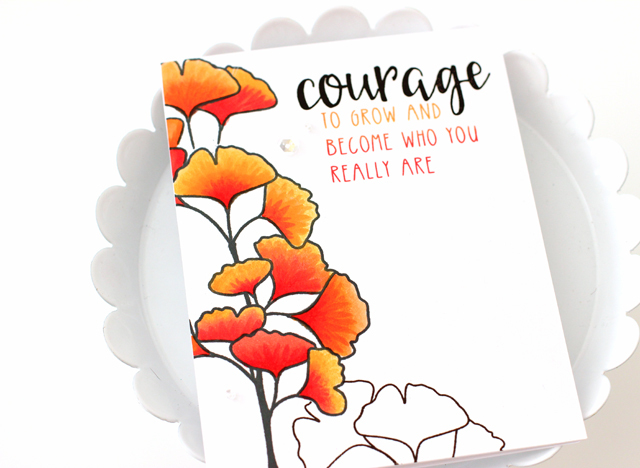 Use Versafine Ink to stamp the "Courage" sentiment and a mix of orange and red pigment inks for the subtitle. 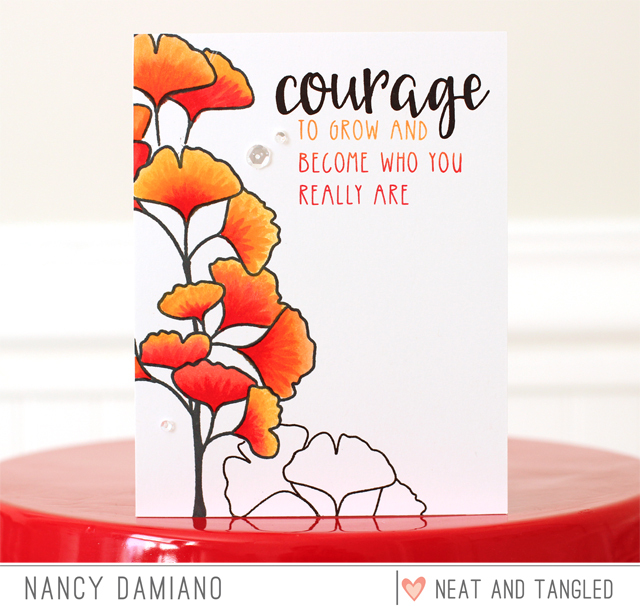 Neat and Tangled will be giving away a Have Courage stamp set. To enter, leave a comment below to be entered. Be sure to visit the Neat and Tangled blog on Friday for a list of winners. Good luck and thanks for stopping by!